Khao Sok National Park is in Surat Thani Province, Thailand. Its area is 739 km², and it includes the 165 square kilometer Cheow Lan Lake contained by the Ratchaprapha Dam. 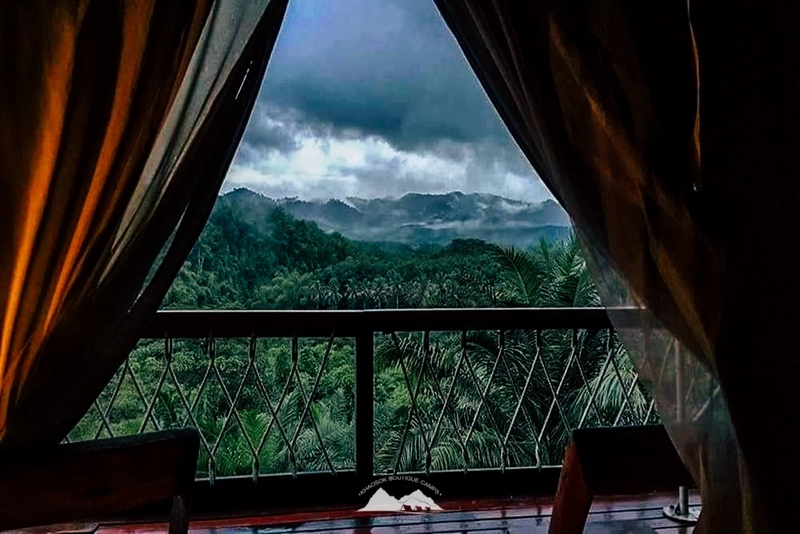 The park is the largest area of virgin forest in southern Thailand and is a remnant of rain forest which is older and more diverse than the Amazon rainforest. 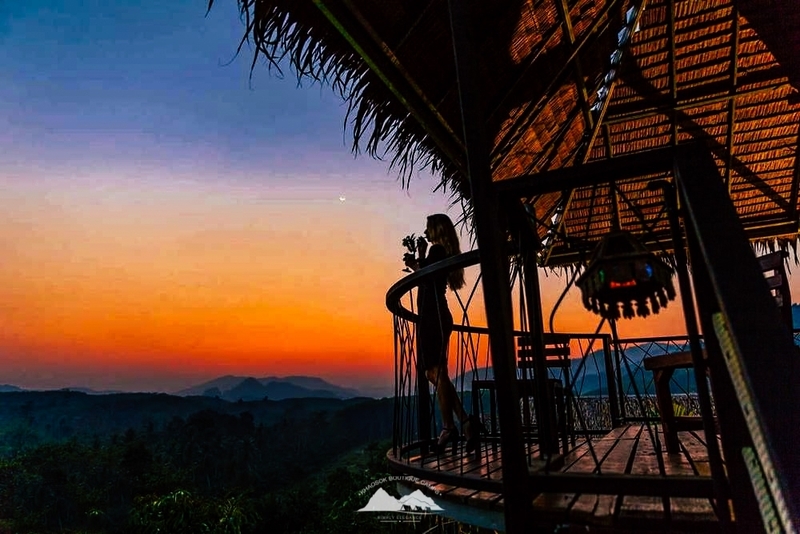 All about the 8-Day Discovery Secret South Of Thailand. 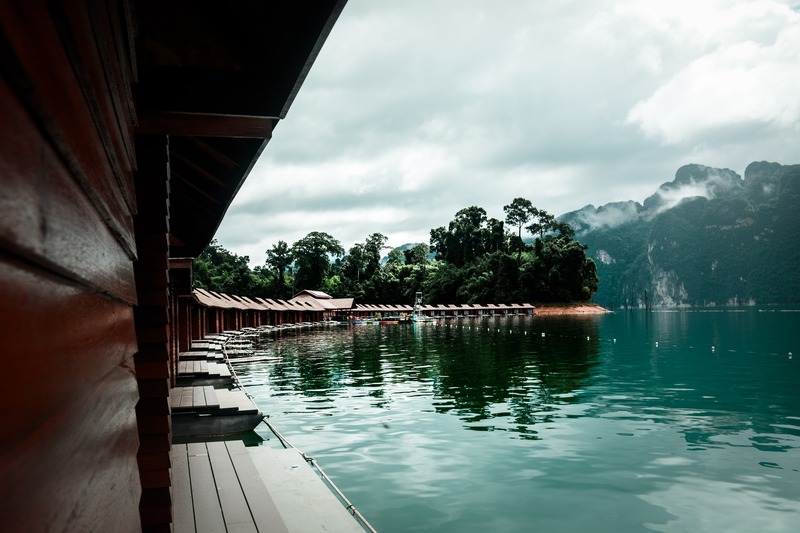 Cheow Lan Lake or Rajjaprabha Dam Reservoir is in Khao Sok National Park in Surat Thani Province, Thailand. It is an 185-square-kilometre (71 sq mi) artificial lake, inaugurated in 1987 with the construction of Rajjaprabha Dam by the Electricity Generating Authority of Thailand (EGAT) as a source of electricity. Rajjaprabha Dam, meaning ‘light of the kingdom’, got its name in May 1987 from the king at the opening ceremony on the king’s 60th birthday. Before that day it was called the “Cheow Lan Project”. It was designed as a multi-purpose project for power generation, flood control, irrigation, and fishery. In 1982, the Electricity Generating Authority of Thailand (EGAT) started construction of the dam by diverting the Klong Saeng River. It took about one year to completely. To flood this large area, 385 families of Ban Cheow Lan village were resettled. Rubber and other farming opportunities such as poultry, fruit orchards, vegetable farming, and reservoir fisheries were introduced together with the needed training programs and credit facilities to sustain farmers’ incomes. Nakhon Si Thammarat is one of the southern provinces (changwat) of Thailand, on the western shore of the Gulf of Thailand. Neighboring provinces are (from south clockwise) Songkhla, Phatthalung, Trang, Krabi, and Surat Thani. The name of the province derives from its Pali–Sanskrit name Nagara Sri Dhammaraja (City of the Sacred Dharma King), which in Thai pronunciation becomes Nakhon Si Thammarat. 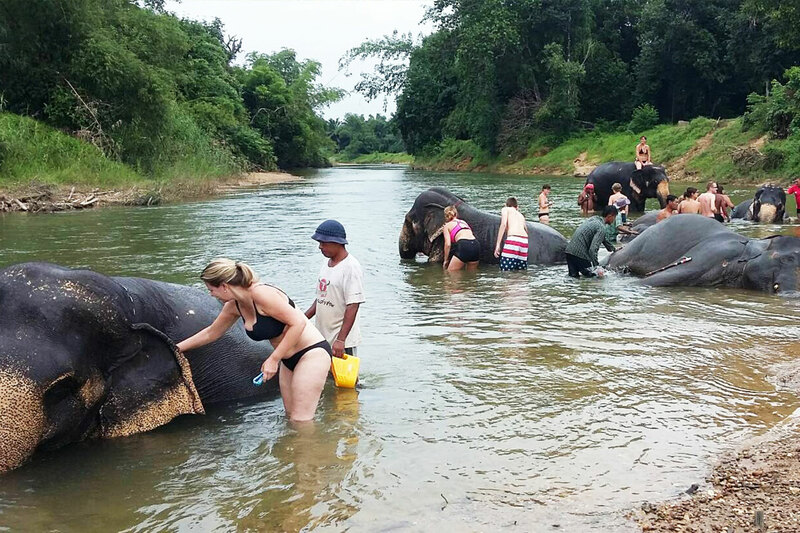 This trip can start to pick up at Phuket, Khao Lak, Krabi, at the airport, bus, or train station in Surat Thani, you will be met by our tour guide and transferred to Khao Sok National Park. 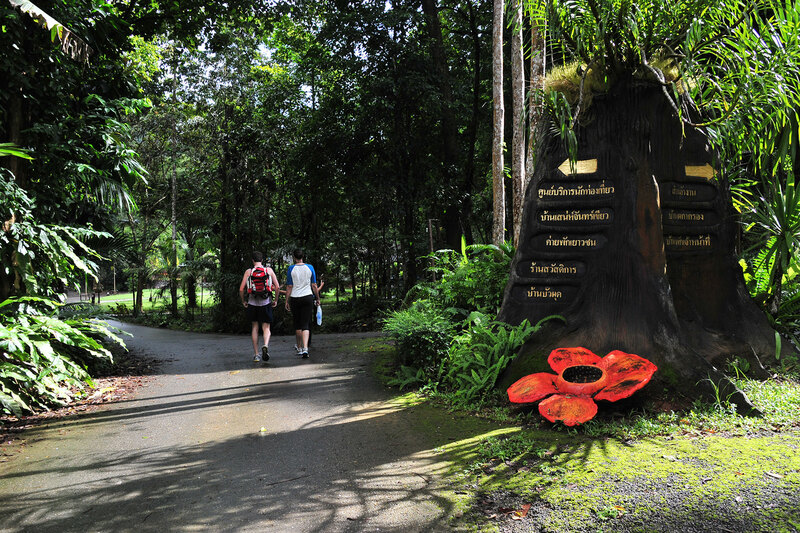 You will start your journey with a 3-hour walk in the national park to discover and enjoy the beautiful tropical forest. We’ll continue the trip by canoe along the Khao Sok river for 7 kilometers, then have lunch in a local restaurant. After lunch, you’ll spend the afternoon with the elephants, learning about the care and feeding of these majestic animals. We’ll make a late afternoon transfer to the Phutawan Raft House for check-in and dinner. 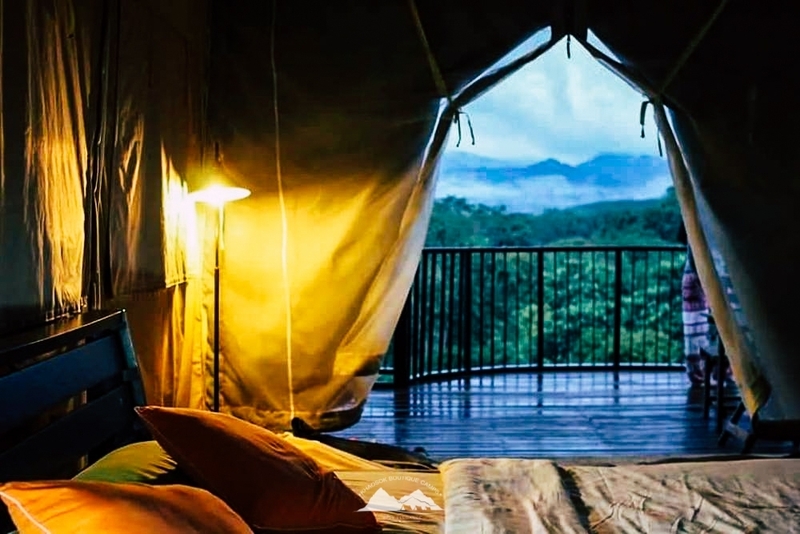 Early rising is highly recommended to see the sun rise over the mountains and and breathe the fresh air before breakfast. At 08:00, you will be transferred by long-tail boat for sightseeing amongst the stunning limestone mountains You’ll also view incredible limestone pillars rising from the sea. We’ll continue by a safari walk of approximately 1 km. 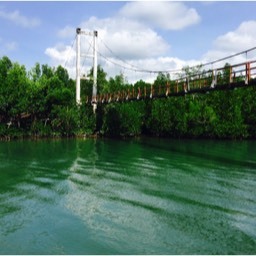 to a bamboo raft to see Pakarang Cave (Coral Cave). This well-named cavern is full of stalagmites and stalactites resembling undersea corals and is quite impressive. In the late afternoon, we’ll return to the raft house for relaxing and swimming before dinner. After breakfast, you’ll check-out from the Phutawan Raft House and we’ll travel to Phra Mahathat, the most important temple of Nakhon Si Thammarat and southern Thailand. It was constructed at the time of the founding of the town, and contains a tooth, a relic of Buddha. The 78 m. high chedi is surrounded by 173 smaller ones. While the chedi is now in Sri Lankan style, it is said to be built on top of an earlier Srivijaya style chedi. The chedi was renovated in early 2009 and now appears like new. At the base of the chedi is a gallery named Viharn Tap Kaset, decorated with many Buddha statues and elephant heads. Viharn Phra Song Ma are the buildings which contain the staircase which leads to a walkway around the chedi. At the bottom of the staircase are demon giants (yak) standing as guardians. Adjoining to the north is the Viharn Kien, which contains a small temple museum. South of the chedi is the large Ubosot building, the Viharn Luang. The monks’ living quarters are across the street in a separate temple, Wat Na Phra Borommathat. The chedi is the symbol of Nakhon Si Thammarat Province, present on the seal of the province. It can also be seen on the Thai 25-satang coin. In the vicinity of the temple, we can visit a local market, where you’ll find interesting silver, brass and buffalo skin puppets, among many other handicrafts and exotic foods. Lunch will be at a local restaurant and then we’ll continue to Pattalung and check-in at the Pakpra Lagoon Resort. Enjoy swimming and relaxing until dinner. 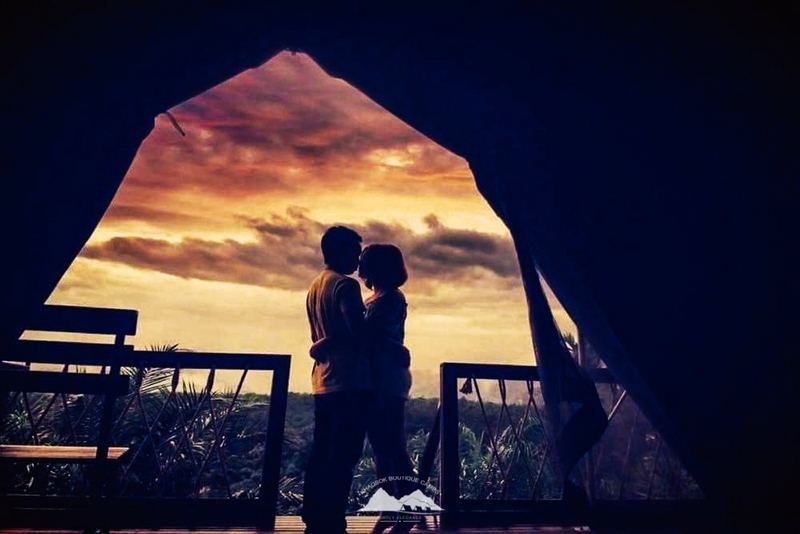 Overnight in the Pakpa Lagoon Resort. We’ll make at 06:00 start to the day with a stunning long-tail sunrise boat cruise in the Thale Noi Lagoon. Here you’ll see a beautiful view of the sunrise, and thousands of birds hunting for their breakfasts, often lighting upon wallowing buffalo. Many lotus blossoms around the lagoon provide a quiet riot of color and form. The tour will be around 2 hours long, Then we’ll go back to the hotel for breakfast. You’ll have a chance to rest a bit before checking out at about 09:30. We’ll journey to the Pak Meng pier at Trang for lunch at 12:00. 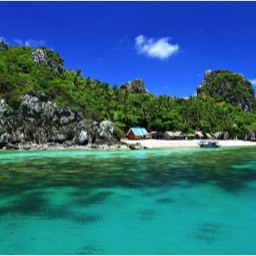 Join boat departure to Koh Ngai island. Check in at Koh Ngai resort, then time for swimming, snorkeling and relaxing before dinner and overnight. 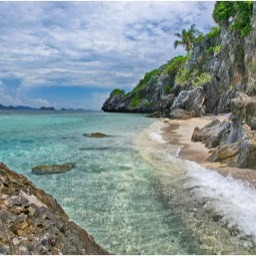 After breakfast, we’ll depart around 10:00 for a boat trip to visit Koh Chuek, Koh Kradan and Koh Mook (Emerald Cave). 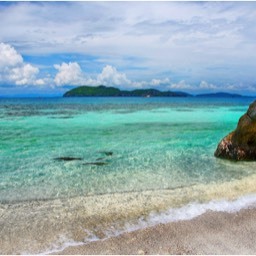 Koh Mook has a secret, sunlit, beach that can only be entered by swimming or boating through the cave. You’ll watch the monkeys agilely scale the cliff walls surrounding the beach. Afterwards, we’ll go back to the hotel for swimming, snorkeling and relaxing before dinner. Morning check-out and then onwards to Krabi. We’ll enjoy a local lunch on the road, then visit the Emerald Pool (a lesser-known Krabi attraction), the hot springs and Tiger Cave Temple. Late afternoon check-in at the Golden Beach Resort near town center at Aonang beach. 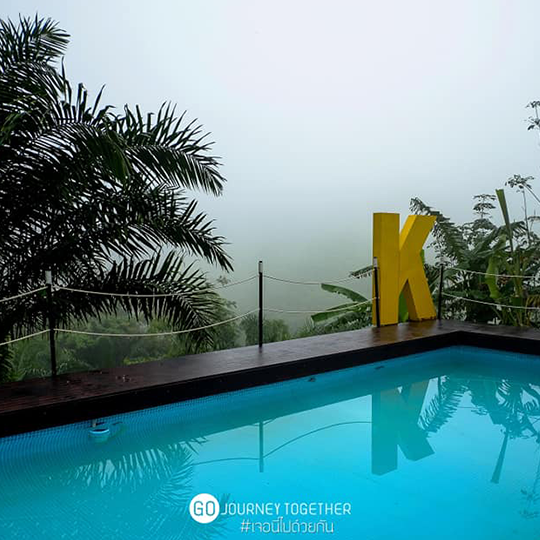 Your evening’s entertainment and dinner are at your discretion…enjoy discovering Krabi on your own! 08:30 pick up from the hotel will take you to the speed boat trip for a 4-island tour. 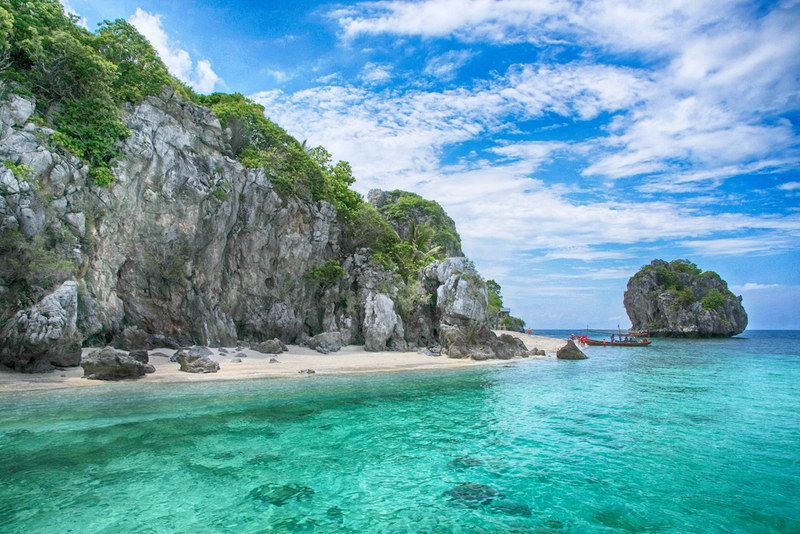 Visit the most beautiful part from the Andaman sea at Krabi bay. Enjoy swimming, snorkeling and relaxing with a local lunch and then back late afternoon. For an evening have dinner in the hotel. After breakfast, you’ll check-out and we’ll continue on to visit Phang Nga Bay by long-tail boat. You’ll view more than 200 limestone karst pillars, near the water cave Tam Lod. A visit to Koh Panyi follows, an island of 200 fishermen’s floating houses, for fresh seafood lunch. Next, an afternoon visit to exciting Ping Kan, the famous James Bond Island. Late afternoon transfer to Phuket for evening flight at Krabi , Phuket airport for your departure or check in at the hotel, as per your requirements at Phuket or Khao Lak.